Here I was, spending my birthday in Houston with friends! We had earlier planned to drive down to Galveston for dinner, but then it started raining so we decided try the newly opened Oceanaire Seafood Room instead. This restaurant has recently come up in the Houston Galleria where Lords & Taylor used to be located earlier. Upscale, with soaring ceilings, ample portions and a menu that is updated daily, the restaurant combines white-tablecloth service with sea-side ambiance. The selection of oysters and the fried-seafood platter I tried were very good, as was the delightful flambeed dessert they specially got us when they realized it was my birthday. Under the blue flames was a concoction made of freshly whipped cream, two different kinds of ice-cream, chocolate cake, and rum. The service is top-notch and the waiters knowlegeable. Fish is flown in daily from across the U.S. and around the world, including swordfish, red snapper, tuna, marlin and wahoo, and can be enjoyed as a chef's daily specialty or simply grilled or broiled. Oeanaire also has one of the best oyster tasting bars. However, note that this is one of the more expensive restaurants in town. Before we came here for dinner, the three of us had spent a couple of hours in a lounge-bar over drinks, getting into really animated discussions on various things that continued on through dinner and during the drive to my friends' new house after dinner. I had a wonderful time. Thank you Arti and Murali, for a great evening! Happy Birthday Shantanu.. Sounds like you had a great meal! Congratulations and hope you had a great day as well. I've had some of my greatest conversations in taverns. Or after dinner, at the bar. 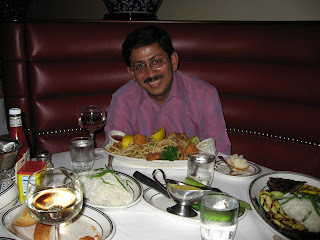 Belated Birthday wishes to you Shantanu! Glad to meet another foodie ... :). Great reviews you have here! Read your previous post, yes Indians have come a long way... we have a large group of Desi friends here who love foie gras and daal-chawal equally and can switch from one to the other with no effort! Sig: Welcome to my blog!